Government House was built in 1834 as the official residence for the Lieutenant Governors of Prince Edward Island. 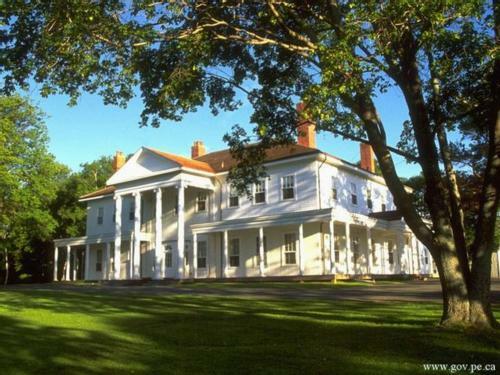 The white wooden shingled building has a commanding view of Charlottetown Harbour and is surrounded by spacious lawns, tree-lined walks, and formal gardens. Government House's heritage value lies in its well preserved exterior and interior elements. It represents several important eras in the Island's political development: from colonial administration, to the achievement of Responsible Government, to the Confederation era. St. John's Island (later Prince Edward Island) became a separate colony from Nova Scotia in 1769, but did not attain a distinctive home for its governor until 1834. In this year, Government House was erected on land which had been set aside in 1789 by then governor Edmund Fanning. Hence, the origin of the residence's official name, Fanningbank. Fanningbank was the host of many significant events in Prince Edward Island and Canadian history. These included the 1860 visit of Edward, Prince of Wales; the 1864 Charlottetown Conference where delegates, including John A. Macdonald, posed on the steps for a photograph. During the First World War, the Lieutenant Governor offered the residence as a convalescent home for returning soldiers. Later in the century, Queen Elizabeth II stayed here in 1959 during her Canadian Tour. Today, Fanningbank is the venue to highlight the accomplishments of Islanders with the annual presentation of the Order of Prince Edward Island, as well as other recognition ceremonies for programs such as the Prince Edward Island Environmental Awards.